Thus narrates the hero of Ali and Nino, a young man devoted to the traditions of the East, Islam and the desert, whose whole predicament nevertheless lay in the West, as he fled war and revolution in Baku, Azerbaijan. 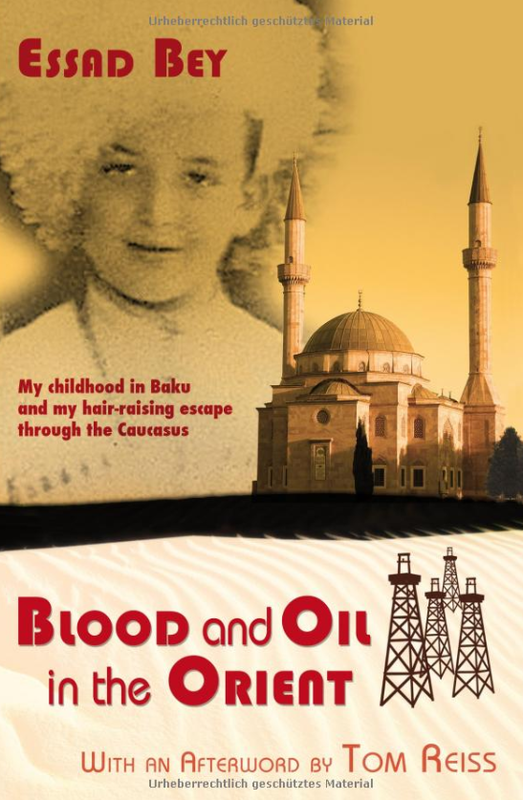 It was also the lifelong dilemma of the book’s author, Essad Bey, born Lev Nusimbaum, a Jew from Baku, unsettled by the October Revolution of 1917 when it swept through Azerbaijan. He sought refuge in Berlin in the 1920s, where he converted to Islam, took on an imagined persona as the son of a Muslim prince, and hewed out a career for himself as one of the Weimar Republic’s most successful and prolific writers. After the Nazis banned Bey from writing in the 1930s, when his Jewish identity came to light, his reputation sank into oblivion. For those who stumble upon Bey through some of his books still in print, the name is shrouded in mystery and conundrum. What was his real name? Was he a Jew or a Muslim? Was he some kind of charlatan, a literary trickster, a crypto-communist as his detractors made him out to be? Or should we take him at face value as a man from the East who genuinely sought refuge in the traditions of the Orient? In 2005, American writer Tom Reiss published a biography that threw light on Bey’s convoluted life. In 2014, a documentary film was made on Bey, and last year, a Ukrainian musician in Berlin decided to put Bey’s life to song after a copy of Reiss’ book fell into his hands. And so Gurzhy, who already fronted a successful rock band in Berlin named Rotfront, decided to form a trio called “The Disorientalists,” devoted to putting Bey’s life to song. Last year they came out with an album, Who was Essad Bey, and now there is even talk of making a musical. But just why is Bey’s life so compelling? And what really was behind his decision to convert to Islam? Moreover, what relevance does Bey have today? Bey was born to a Jewish oil baron father and radical revolutionary mother who had bankrolled Stalin. Weaned on stories of Arab bards, Persian wise men and Turkish knights and horsemen, Bey grew up in pre-revolution Baku, capital of Azerbaijan, a small, oil-rich, Shia-majority country that boasted ties to Europe yet remained steadfastly Eastern. After Bolsheviks captured Baku in 1920, Bey embarked with his father and his German governess (his mother had since committed suicide) on a long and circuitous journey that took them across the Caspian Sea, through Persia and the deserts of Turkestan, to Istanbul, Paris and ultimately Berlin, where he was matriculated at the Russian gymnasium in Chalottenburg. An extremely precocious youth, Bey decided early on to fashion an Eastern identity. He performed his shahada while passing through Istanbul en route to Paris, but felt that it was not binding enough. He converted more officially in Berlin before the Imam of the Ottoman ambassador in 1922 in the final days of the Empire’s existence, and took on the name Bey. He thereupon embarked on a literary career, brilliant and prolific as it was, fraught with controversy. To distinguish himself among Berlin literatos, he cast himself as a Muslim aristocrat of Persian and Turkic heritage. In this fashion, he told fairy tales about his family history while also turning the history of the East into fairy tales. By the end of his life, he had written 16 books, most of them international bestsellers, translated into 14 languages, and sold in 17 countries. At the height of his career, he was famous in Europe and the United States, the author of acclaimed biographies of the last Czar and Stalin, and even the center of tabloid gossip in New York and Los Angeles. He also moved in the glamorous circle of exiles, including the Pasternaks and the Nabokovs. There was only one mosque in Berlin in the interwar period to speak of, a Mogul-style edifice constructed between 1924 and 1927 by the Lahore Ahmadiyya movement, a mosque that Bey almost certainly would have set foot in. There were also a number of congregations, which, if nothing else, were marked by their mutual enmity, infighting and competition. There were many Indians and Arabs in Berlin, but few Turks, which is remarkable considering the majority of Muslims in Berlin today are Turkish. Interestingly, single Muslim men were looked upon as desirable by German women for their exotic appearance and air of mystery, Haacke says. It is still unclear if Bey’s conversion to Islam was just a PR gag, or if it was at all based on real religious conviction. Unfortunately, Reiss, Bey’s first biographer, does not delve into Bey’s religious life, laughing at what he perceives to be part prank, religious alibi, shrewd survival strategy and youthful eccentricity. For Reiss, Bey remained, as always, the Jew from Baku. Bey’s first novel, Blood and Oil in the Orient, got rave reviews across Europe and America. But the German press could be hostile. Many Muslims construed the book as an attack on the East. One critic, in a protest sent to leading newspapers, wrote that the book pandered to loathsome stereotypes, motivated by a wish to “discredit the Orient in the eyes of Europeans.” The critic also claimed, “His pornographic book bears the stamp of the filthiest agitation and the statements contained therein are lies from beginning to end and the basest form of slander.” The protest was signed by a long list with one representative each from a dozen Muslim countries with exile nationalist groups based in Berlin. Bey’s old club, the Islamic Institute, a Berlin-based association of Muslims from all parts of the Islamic world, joined the campaign against him. In the spring of 1930, its board accused Bey of having insulted “the feelings of the world with his (literary) scams” and said that it wanted nothing more to do with this charlatan who had passed himself off “as a native Muslim, contrary to the facts.” Its business manager, Muhammad Hoffman, himself a convert, attacked Bey for attempting “to pass for a born Muslim,” and even cast doubt on the authenticity of his conversion to Islam, suggesting it had been a ruse. The campaign against Blood and Oil, which took on a marked anti-Semitic character, ultimately reached the foreign office. Bey’s book, it was felt, had the potential to diminish the reputation of Germany and the Orient, and could damage friendly relations between Germany and the Middle East, prompting exile-politicians to try to ban the book. In the end, the whole hullabaloo only meant increased sales. Bey fled to Italy in 1938 with the unbelievable hope of becoming Benito Mussolini’s official biographer. It is an interesting fact that in the early years of Italian Fascism, some Jews supported the movement, and Mussolini himself offered some criticism of Hitler’s anti-Semitism, which he called “the German vice.” However, ultimately as Italy threw in its lot with Germany, Italian Fascism became explicitly anti-Semitic, and many Jews forsook the movement. Not Bey. In 1942, he died in Positano at the age of 37 of little known Buerger’s Disease, as a result of his heavy smoking. He was given a Muslim burial, the Quran placed under his head and his face directed toward the east. Reiss saw him as playing the comedy of identity till the bitter end. However, Sonja Hegasy of the Leibniz Zentrum Moderne Orient (ZMO) research institute in Berlin maintains that Bey’s primary researcher Gerhard Höpp (also affiliated with the ZMO), a German scholar and Orientalist who devoted his life to the study of Bey who had intended to publish a definitive book on Bey before his own untimely death in 2003, had little doubt about the authenticity of Bey’s relation to Islam. “Professor Höpp concluded that his conversion was a real one, it was not a play, it was not a game,” Hegasy told me. Bey’s life and works remain to this day shrouded in mystery. Professor Höpp maintained that Bey’s conversion to Islam was genuine. Yet it is clear from his novels, such as Ali and Nino, that he played to the gallery, so to speak, exaggerating the exoticism of the Muslim East to fit modern stereotypes. “There is no question that he fed people what they wanted to hear,” Haacke says. Clearly, the life of Essad Bey is a field of research that has yet to be exhausted, and the final word remains to be made.